Emacs switched the version control system from Bazaar to git yesterday, so now is the time to start hacking away at Emacs. Emacs: The Best Thing Since Sliced Bread If It Wasn’t For The Fact That Emacs Was Actually Invented Before Sliced Bread. This is a very short how-to guide on building and then contributing to Emacs. And you’re off! If you know what you want to add to Emacs, just start hacking away. 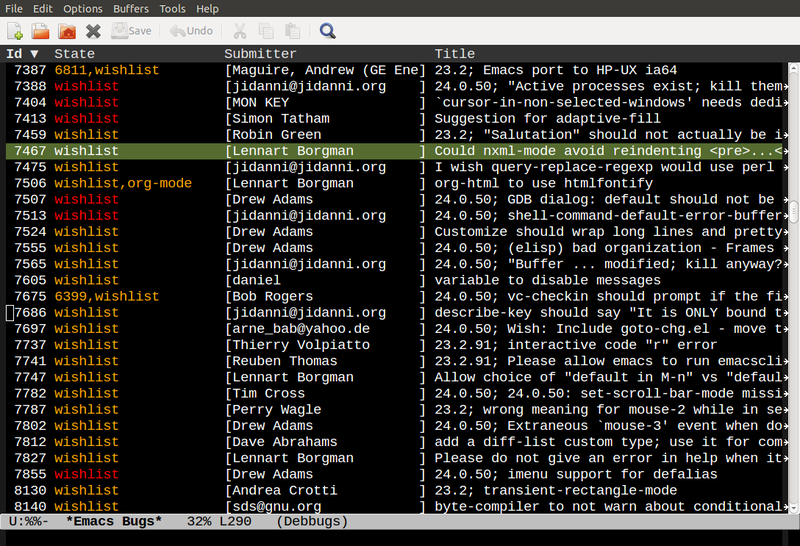 If not, you should have a look at the wishlist in the Emacs bug tracker. Starting with a new feature can be less daunting than starting with a bug, since it’s more open ended. And more fun. First we need to get the bug tracker into Emacs. This will list everything that anybody wanted, but nobody got around to doing anything about. Find one you think look interesting, hit enter to read more about it, and if you think you want to have a go, start hacking away. When you’re done, make a diff, reply to the bug report with F, and include the diff in the email. Emacs requires a copyright assignment on all bits that are larger than 15 lines. Send an email to copyright-clerk@fsf.org saying you wish to assign your Emacs code to the FSF, and they’ll get back to you on the paperwork, which is very un-daunting. If you’re fixing lots of bugs and adding lots of new code, just ask for commit rights to the Emacs repository, and your code will fly out a lot faster. If you have instructions for other OS-es, or these instructions here are wrong, please leave a comment. If you need more information on the git flow for Emacs developers, have a peek here. Nice write up, I didn’t know about debbugs. Would be good to know how to do this with branches and pull requests! Diffs feel old. Thanks; I’ll update the recipe. Would they produce the same result? I actually doubt people who said they can’t contribute because of bazaar will now contribute because of git. Is it enough to do just “make” after updating local Emacs repo? When one should use “make clean” or something similar? From a fresh “git clone” checkout, it’s sufficient to just do a “make”. A more complete approach is to run ./autogen.sh && ./configure before running make. There is a GNUmakefile in the checkout. If you’re running GNU make, it will do everything you need. I’d better add a WARNING to make it clear that “git clean -f -d -x -q” *silently deletes all untracked files and directories*. If you have any untracked work-in-progress, or similar, that’s liable to ruin your day. The purpose is to reset the working copy to a pristine state, as if it were freshly cloned. If that’s not what you want, please don’t run that command. My question was regarding compilation after further updates. “git clean…” cleans working copy, but then I have to recompile whole Emacs, which takes some time. Is there a faster something like incremental recompilation or just a way to not have to recompile whole thing again? BTW another helpful thing for new emacs devs would be how to write and execute unit tests for emacs. I know how to run ERT tests from command line, but how do you test C source (AFAIK it’s possible, there’s a book “Test Driven Development for Embedded C”)? You should never have to say “git clean” or anything else in particular. “git pull” and then “make” will rebuild the pertinent parts. The only exception is if a major, major change has taken place, and then you may have to say “make bootstrap”, which will rebuild everything, and that takes a while. Genius to have such a simple workflow. I predict an outpour of new features, at least one from me! Great material! 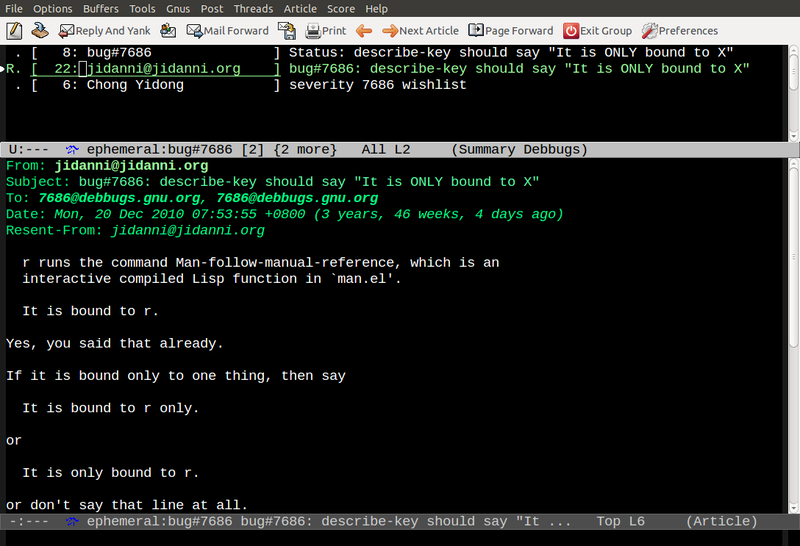 Should i learn Lisp to contribute to Emacs? Thanks. Anyone in doubt should simply look at the usage, and construction of the lisp Loop macro. Then take a little time to realise what can be done with via. lisp macros. Language feature you like? Ok, lisp can do it, or you can implement it. For some reason (cost most likely) Lisp missed the boat, or we collectively missed the lisp boat. Either way, it’s never too late, Lisp will consume the industry when enough people get it. If not, we’re a stupider species than I previously imagined. If you want to build on OSX, the default invokation of make will get you an X11 executable. You need to invoke ./configure –with-ns to get a different Makefile. There’s more information in nextstep/INSTALL. That sounds like something that should be changed, perhaps? I would assume that the vast majority of Emacs users on OS X wants the native build. As far as I can tell ChangeLog files aren’t being kept up to date on a continual basis anymore. Someone updates them just before a release. So you probably don’t need to worry about merging them anymore.